It is a nice fairytale book for children. 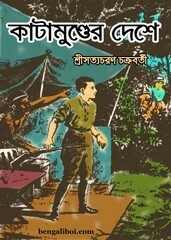 The story of this book is written by Satyacharan Chakrabarty who was an well-known senior writers of child literature. Dear little friends, collect this Raja, Doityo, Danaber story book as a pdf file. There are two more stories- Ajab Ghum and Ore Babare in the collection. The children novel ebook pdf has 83 pages, 8mb file size.